It's a link to the Diane Rehm show from this morning. I got myself lost retrieving Dear Son's tuba from the tuba repair guy so I got to listen to most of it. I had kind of weaned myself from news shows since the last election. I was getting so overwrought over the studip on the radio, even on the rarified waves purporting to be NPR (sometimes I wondered), that I was yelling at radio personalities ("Mom, they can't hear you...") during car-pool. A few times, I even forgot to drop off the other kids and pulled into my driveway in a huff with a car full of not-my-progeny who meekly from the back seat asked if they should just walk home. Time to cut the crazy out of my life. For a year or so, I listened to books on tape or on the ipod. Good enough. Lately, though, I've been feeling out of the loop. Like, I totally had no idea Carmageddon was even a word, let alone a big hairy deal and I read about the Norwegian bombings on Twitter. Time to re enter the fray, I thought to myself. The first several car rides with NPR were only mildly upsetting. The interview with the Tea Party guy yesterday, for instance, who doesn't believe that the Congressional Budget office is telling the truth when they say that the deadline for renewing our credit rating is August 2nd. He thinks it's probably sometime a week later so we have plenty of time to hammer out something that he and his constituents can swallow. "I've got something for you to swallow," I muttered as I pulled in to pick up the CSA share. (Saturn peaches! OMG! Who knew? Not sharing.) See? No ranting, just muttering. But this morning had me yelling again. Several states, it turns out, are eliminating the Palmer method of cursive from their curriculum. Actually, Missouri did just this 12 years ago. Doesn't mean it's not taught, just not tested. Sheesh. Duh, the handwriting grade having been the bane of my 3rd graders' existences -- both of 'em. Not fine motor kids. Anyway. The panel on the show today discussed (ad nauseum) the merits of cursive writing, with the lone dissenter being a scientist from Oberlin talking about kids and the digital age. Wah, wah, kids should be able to read and write in cursive, wah, wha, cursive taps into the creative part of the brain that's left un tapped by a computer, wah, wah, your cursive signature is your calling card, wah, wah, no one writes anymore and no one saves any of their writing and look I have a shelf full of Edith Wharton's letters to her friend which I treasure, wah, wah. 2. There is no science (according to Scientist Lady or SL from now on) to back up the idea that centering yourself in front of a notebook with a pen and writing in cursive taps into any different part of your brain than typing does. Like they hooked people up to brain scans -- no science. What there is evidence of is the increased level of thoughtful revision that takes place using a key board as opposed to a pen and paper. And the measurable increase in sheer volume or number of words. Not always a good thing, but hey, measurable. I mean, duh, I type way more words than I'm willing to hand write. And I revise both on the fly and after the fact much more easily using a word processing program than I can on paper. More neatly too. 3. Yeah, a signature means something. But you don't need one to file your taxes any more. Or to use a credit card. My kids' signatures are pitiful. Not the least bit flowery or Declaration-of-Independence worthy. They should probably work on that. Hubster's signature consists of some humps, some ticks, and a straight line. Seriously. So easy to forge it's a shame. And the caller who said she doesn't even consider a teen applicant to her mall shop who can't sign the application with a nice cursive signature? Discriminate much? What else ya got? 4. No one writes any more? Are you kidding? My kids write way more than I ever did as a kid. I wrote thank you notes to Grandma Buckley and that was it. Well, and this one weird chapter thing in 7th grade because I was in love with David Galucci and had to get my feelings on paper. My kids text and post on Facebook and blog. They write stories and comment on news websites. All of that is writing. Heck, I write way more now than I ever did before I started blogging. And look at the sidebar... see? All saved for posterity. These are my letters to all of you. Seriously? Have you read Edith Wharton's letters? She would totally have had a blog. Oh, I guess some of this is tongue in cheek. I love beautiful handwriting and aspire to it myself. But, the fact that these folks stuck dogmatically to their ideas in the face of science which proved the opposite made me angry. And of course there was a generational divide. Older folks seemed to prefer what they've been taught and eschewed texting and tweeting and the language engendered by electronic media. They also tended not to categorize those activities as "writing". I disagree is all. The show ended with a giant can of worms, though, and I really enjoyed the near sputtering that ensued. SL admitted to the fact that is is indeed much easier for kids to plagiarize now, with cut and paste, than it used to be, although most colleges, and even high schools, have a program that pretty effectively weeds this out if you have an electronic copy of the work. Yes, that is true. She also dropped the bomb that she thinks we need to have a more fluid idea of what constitutes plagiarism in the face of modern technology. I thought the host's head (not Diane) might explode. I guess I'd like to hear what Science Lady's idea of this more fluid approach might be. To do that, I'll have to get her book. There are probably no naked Highland warriors in it though. 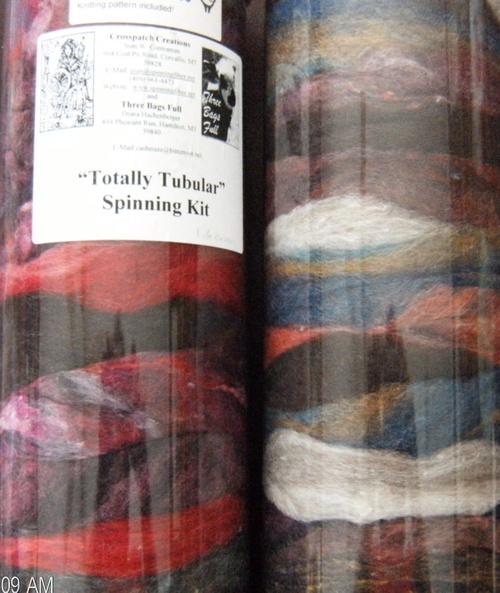 And speaking of naked, now, I am going to spin the new Spunky Eclectic Wensleydale fiber I got in the mail yesterday. And I'm going to listen to a bodice ripper while I do it. (Oh, this one's good -- long-lost daughter of a Russian nobleman raised by Dakota Indians, transplanted to Regency England, takes the ton by storm and captivates a brooding duke... fluff, fluff, fluff.) No more news programs for me today. I've been toying with my camera and with photo editing software I got for my computer. When Hubster got me the computer last year, he got me Apple's professional photo editing software, Aperture. For this Photoshop girl, Aperture was a mystery. I couldn't even get beyond uploading pictures. Very frustrating as all the forums I read kept touting how intuitive the program is. My intuition must be broken. Or skewed by years of Microsoft programs. Whatever. The classes for using Aperture are offered the first Monday of the month at a far away mall's Apple store and that always seemed to be a time when I couldn't up and leave the house from 5:30 to 9. Well, I didn't make it a priority and when I'd look at the class schedule once in awhile, I couldn't go that month. Whatever again. Enter Apple's new program, iLife. Phew. Now I can do more complex photo editing with iPhoto. I can manage tone and tint and balance with easy slide icons. I can mess with fun edge treatments. I still have to figure out how to layer in text, say for a banner image for the blog. Above is the un-retouched photo. Pretty, isn't it? With the red and not-quite-traditional-Christmas green bulbs in a cracked glass bowl with December twilight in the background? I lost this picture for a year on a misplaced San-disk or I'd have used it for a holiday blog banner this year. Maybe next year. Anyway. A lovely picture made more vibrant and arresting I think. I don't know, maybe your monitor doesn't register a difference. Mine does. Those of you who blog, or even you who don't and just save your pictures digitally, do you retouch your pictures before you post or save them? Just curious. I almost always do, even though it often adds 45 minutes to an hour to my blogging time because I'm just not familiar with this software... yet. Maybe I should use this image for a Christmas card next year. That would, of course, require sending Christmas cards. Which I should do anyway, but have gotten out of the habit of doing... Perhaps this could be the motivation. 10. 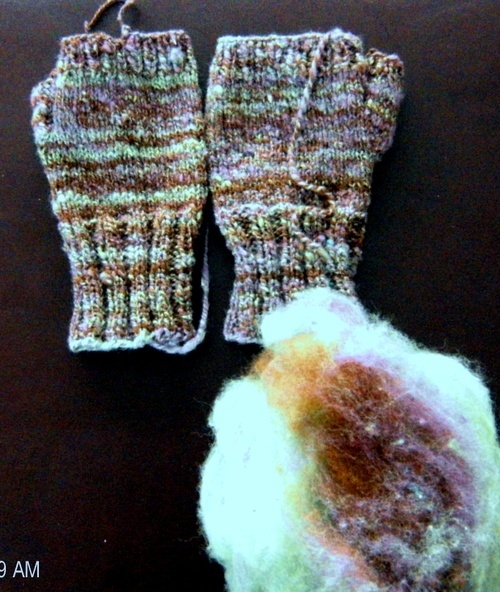 I have too much laundryshoppingcleaningknittinghomeworkhelpingworking to do to stop and blog. 9. Notice that spinning isn't in number ten? It gets a slot all to itself. I've ordered roving from the Loopy Ewe, Hello Yarn, Funky Eclectic, and Crown Mountain Farms. On top of the Dyeabolical rovings I have. They all CALL me from the other room. Can't you hear them? spin me! no me! ply me with that other one! we all want your attention! 8. Construction is ongoing. And while the men who arrive at my house every morning at 6:30 a.m. are not holding me hostage and away from my computer, their presence messes with my routines and those of the dogs and the kids and the husband. 7. My knitting has been minimal -- no progress, in fact reverse progress on the second iteration of the Kauni Cardigan. I did do an Irish Hiking scarf for me out of my handspun. 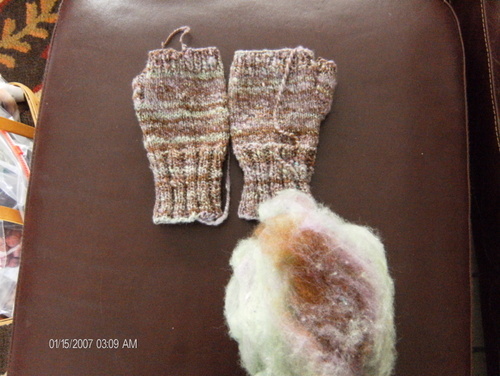 I periodically pick up an old sock and work on it. And Cecily's lace. But not a whole heckofalot else. 6. It's Lent. And while I've been busy with baking and singing for Fish Fry Fridays as in past years, I've knit nothing for charity. A few things for others, but nothing for the less fortunate. I'm a bad person. Really bad. That's hanging over my head but... well, watch the rest of the list. 4. I've been working. Not a lot, just two or three days a week, but when I'm there it's BUSY. The recession that all of the news outlets have been going on about ad nauseum (ever heard of a self fulfilling prophesy?) has not hit our yarn shop. Or architecture for that matter (hubby's busier than he's ever been, but don't tell anyone I told you). I think the banking industry and home builders in this country behaved abominably over the past 10 or so years, raking in record profits and loaning irresponsibly. The situation in these two industries and the numbers tied to them, coupled with gas prices are leading to alarmist behavior in the media. I read a piece in the Wall Street Journal saying just that. That there are many sectors of the economy that are doing really well -- home rehab, nesting stuff, entertainment and technology for instance. So there. 3. I was really sick. Like as sick as I've been in my adult life. With the flu. Weak as a kitten. Still have a little upper respiratory stiff even after 4 weeks. I did not get a flu shot. But plenty of folks did and got it none the less. Dear Son missed 5 days of school. I missed singing at two Friday Fish Fries and I missed a week's worth of work. Sick, sick, sick. 2. I don't have a camera that works. And I really like to put pictures up on the blog. I'm a visual person that way. I've tried to buy one, but one place I went was out of the cameras I wanted and anyway the guy waved me off saying there was going to be some big news/new technology in cameras. The other place said that people who had gotten tax rebate checks had bought all the cameras I wanted. Rrright. Things are crazy all over. Really. And the number one reason I haven't been blogging? Well, I never bought any Mystical Creations Yarn (The first is a blog with links to some crazy customer service stuff, the second is a Ravelry specific link, sorry) So I figured no one wanted to read or talk about anything I had to say anyway. Seriously, folks. Is that some crazy stuff or what? First, I'm really glad I never mis-dyed yarn and tried to sell it to any of you all. 'Cause you people are some crazy internet stalkers when it comes to yarn acquisition scorned. Second, I love me a good internet car wreck. So. Where to now? To talk to my contractors. To try and buy a camera. To choose curtains and furniture as I gave away most of the furniture that was in the front two rooms. To work. I meant to start up 40 Days, but after Ash Wednesday we got hit, house wide, with the flu. We're all very sick. I'm the first to be upright in days and this little post and a pot of soup is about all I can manage. See you when we're snot free. When my camera is on the fritz! I can't get a good picture of my knitting or my spinning to save my life. And it's not like I don't have things to say (read gripe/comment/preach about) 'cause I do! It's just that I usually get motivated to get on here by pictures. So. Here are some cruddy, kid-camera pics. Motivated by Carole and Margene and their NaSpiMoMo (yay, it's extended for another month! ), I spun my little heart out this month. And knitted it all up! Here are the 8 oz of Crown Mountain Farms Yak and Merino mix. Spun up I think into a heavy worsted weight (I used 9s for the scarf). The pattern is my own (more on that later) and this yarn is the softest thing ever. I mean, one of my trademark sayings at the shop when someone complains about wool being a tad scratchy is, "Well, we aren't going to knit underpants out of it are we? 'Cause if we are, then, yeah, it's scratchy..." Baby, you could knit underpants out of this stuff. And hoooboy is it warm. Just in time for it to be 72 degrees here. Yeah, right. We are going to get some thumping storms tonight I'm thinkin'. 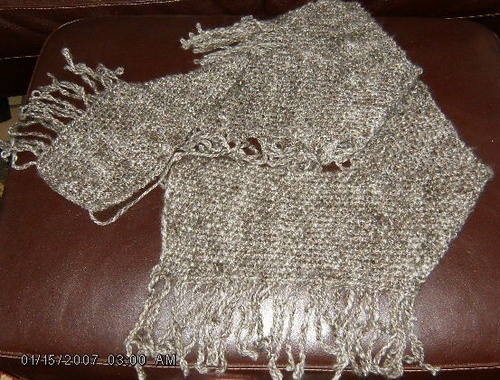 And here is my short row scarf. She met Rachel (the roving was dyed by Rachel at Dyeabolical) on her maiden voyage too! On Saturday night. When it was still COLD! Ahem. I used up every last bit of the yarn I spun from the 4oz of roving and I think that the scarf is the perfect pattern to show the color changes in this yarn. I used 5s so I guess the yarn was maybe DK weight? I don't know and I didn't measure the wraps before I used it all up. I'm a baaaad spinner. Ok. The true color of this roving and the yarn I spun from it is somewhere in between the colors in these pictures (darn kid's camera). The greens are like what's shown in the picture on the left, but the picture on the right shows the browns better. Oh well. 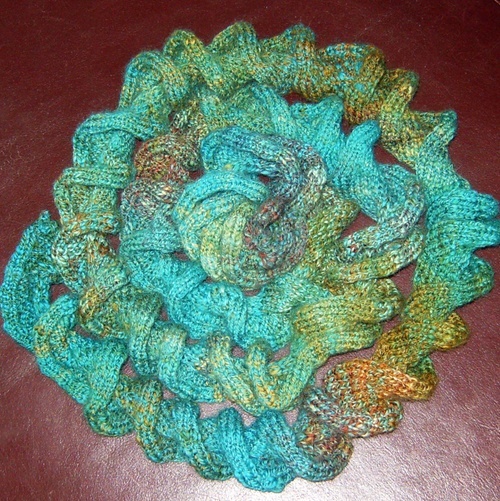 It's called Triple Play Roving and the colorway is called Mint Chocolate. And it is. Really. It's wool (they include what I think are the names of the sheep...don't you just love that?) and rayon and tussah silk and silk noil. I got yarn a lot like Rowan Summer Tweed. I got the roving and these two Totally Tubular Spinning kits when I clicked to The Bellwether from Ravelry the other night. It all came within about 2 days and the service and representation of the products was great. Go and shop there. The kits come with stranded patterns too, and instructions on spinning up the tube of stuff to get that approximate yarn. Too much fun, don't you think? And today is Mardi Gras. Later today I'll get the 40 Days for Others blog up and running and you can sign up and post there to your heart's content. I think I'll be knitting up some handspun for charity! Please let me know.. what do you see as my banner? All I can see is a little kind of unfinished blob of white with gray lines... not resembling what I had in mind at all! It should be a closeup of Kauni with my blog name and quote... is that what you see?